I don't understand women. You can put that on a long list of things I don't "get": skateboarding, Harley-Davidson motorcycles, String Theory, and the allure of NASCAR racing. I want to understand women, however. Well I want to understand them well enough to keep them around. One of the thousand things about women that baffle me is the vicious abuse of their hair. I went to art school with a tall, pretty young woman who wore luscious hair down past her waist. Most of us experimented with our looks during that time, and Miss Wonder Hair decided to shave her head bald. I never knew why she did this, or if the result satisfied her. Her action shocked me, nonetheless. I felt like I'd just watched her flush diamonds down a toilet. Later I worked with another woman with exceptionally beautiful hair. Because of—boredom? self-hatred?—she started coloring, cutting, and waving it. After two full years and many hundreds of dollars, her hair reached a kind of terminal state, wherein it was indistinguishable from cat feces. Years ago I subscribed to Vogue Magazine. Every issue had a section I called, "Rats' nests in zero-gravity." I didn't see a direct example in the latest issue, but there were plenty of heads that looked like road kill. Granted, some women have "problem hair." They need help, and thank god the industry is there for them. I don't know why women with healthy hair undergo severe treatments that often make them significantly less attractive to me. They really ought to consult me first. Men don't seem to figure in this sport at all. I've never heard a guy say, "I'd ask her out, if only she put some highlights in," or "Cute girl, but she should cut her hair shorter." The other odd thing I've noticed is the absence of satisfaction for the subject. During my co-worker's two-year transition from Dream to Nightmare, I never once heard her say, "I like my hair now." She went from Mary-Ann pigtails to a seven-color Mohawk without experiencing one happy day. The theme of this series is the triumph of culture over nature, and the War on Hair is another example. We depend on nature and respect it, else we could not survive. At the same time, we want to conquer and master nature. Relentlessly, we bend nature to our will, even when that bending results in the destruction of nature. My meagre guess is that women experience this struggle in miniature, on the battlefield of their scalps. Women all but deify their hair, but also change it and kill it. Last night I watched the original Star Wars movie with my son. It's been about thirty-four years since that movie was first shown. 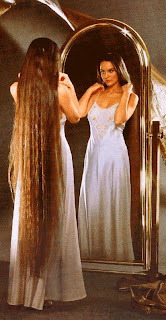 After all that time, Carrie Fisher's hair still fascinated me. Even on a movie set, how was it possible to keep those two cinnamon buns in perfect shape on the sides of her head? 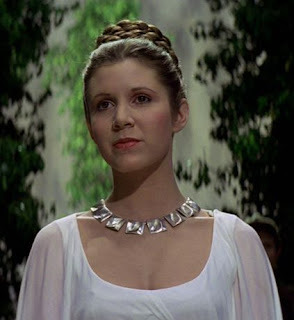 In the final scene, Princess Leia bestows medals on Luke Skywalker and Han Solo. Her hair is different now, bound up in a braid, her crown. Maybe that's the seduction of restyling one's hair. It's the illusion of supernatural power. We want other people to think that we can become someone different, anytime we want to.